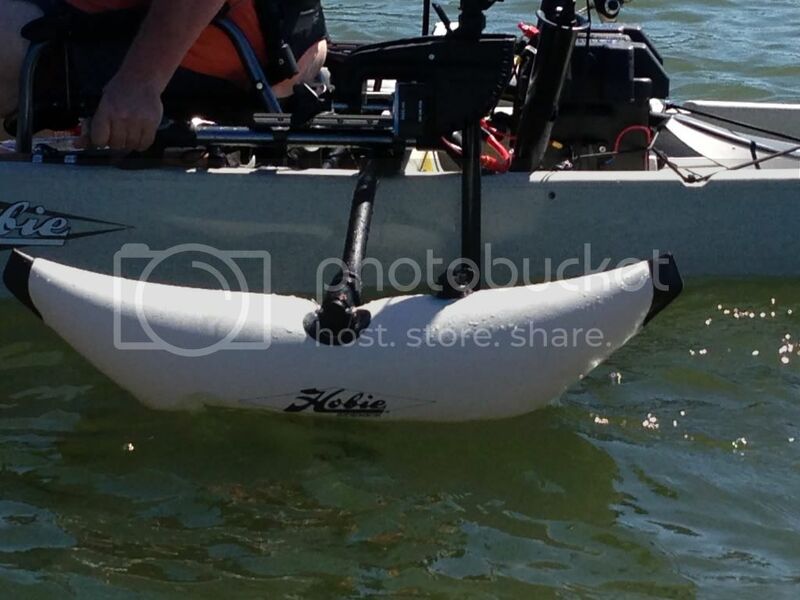 Hobie Forums • View topic - Sidekickers and trolling motor mount. Sidekickers and trolling motor mount. 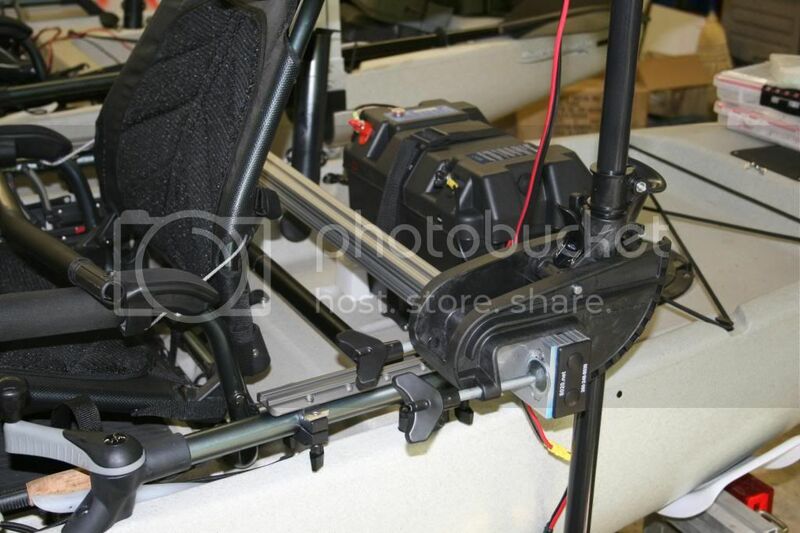 Post subject: Sidekickers and trolling motor mount. 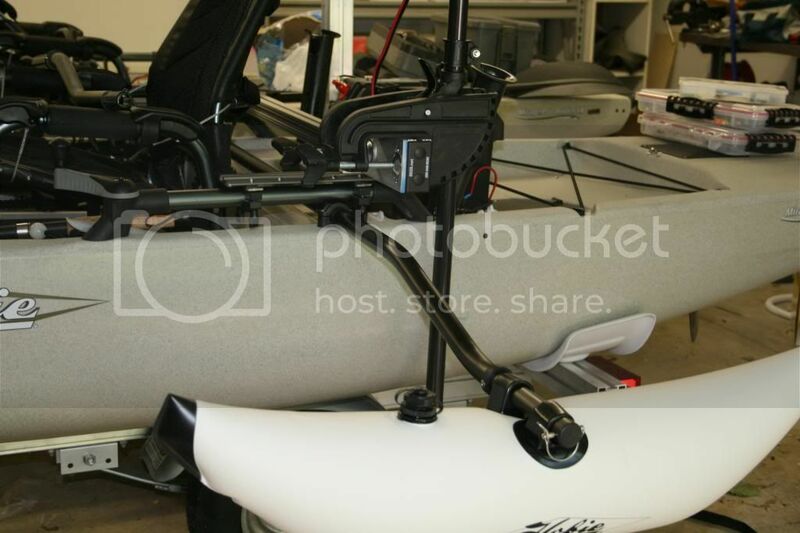 After several outings, I decided to add Sidekickers and a trolling motor to one of my PA14. i am a big man @ 350lbs, and while the PA is extremely stable, I have noticed it to be a little tipsy when I have the seat in the elevated position. I just want a little insurance that I won't be going for an unintentional swim with a wrong reach or move. The Sidekicker kit is NOT designed for the width of the PA. I ordered an additional mount tube and cut both tubes down and joined them in the center to make one long tube. Luckily I work in a machine shop and had my guys make me a 6" long aluminum joiner piece to slide into the tubes, that I epoxied in place, making one long tube. It's too bad Hobie doesn't offer a kit with a long tube for the PA. 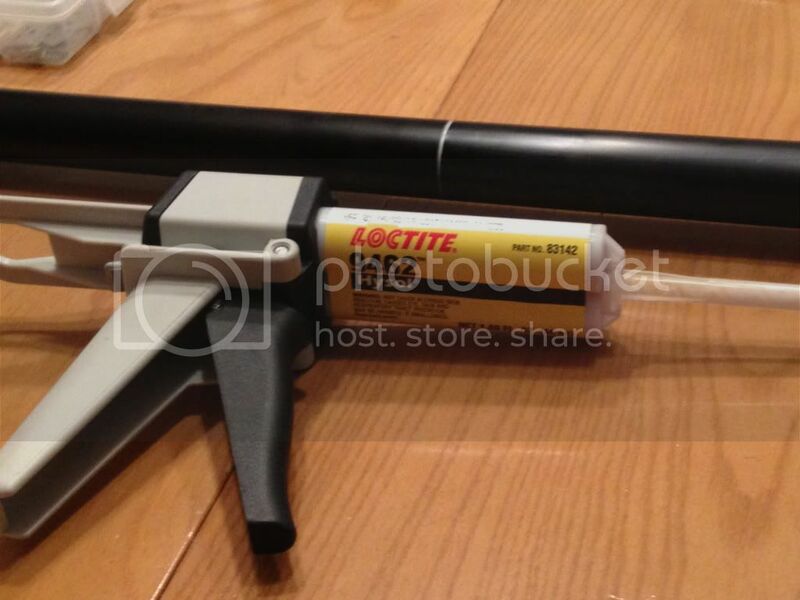 I used Loctite Hysol epoxy to join the tubes. It s very strong stuff. I mounted them just behind the seat. The mounting brackets fit just right up under the side handles. I did need to remove the rear handle bracket and tube to mount the Sidekick brackets. Then put handle back in place. Now I just need to get the wet and see how the do. 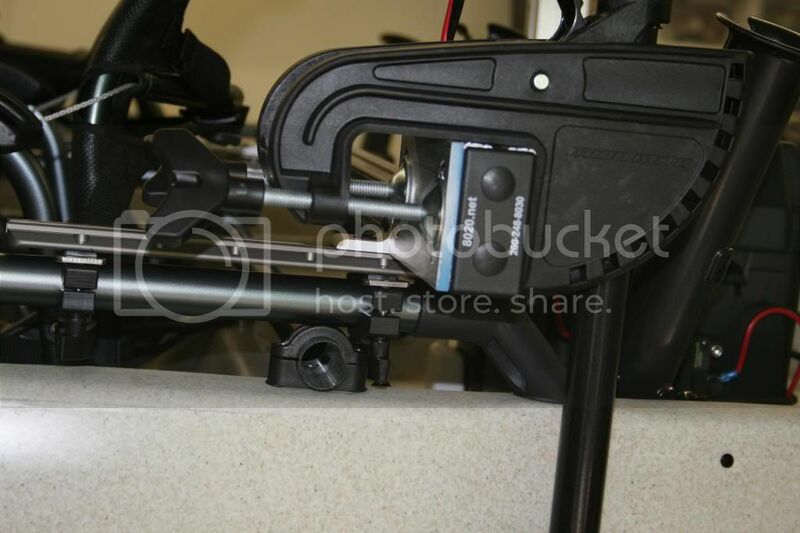 Post subject: Re: Sidekickers and trolling motor mount. I looked at several options. I even built one of Tom's simple PVC mounts, but decided it was just a bit to flexible for me. There was way to much flexing movement in everything for me to be comfortable with it. The Minnkota 38lb transom mount motor is quite a bit heavier than I expected and I think that s why the PVC seemed so flexible. What I ended up with wasn't the simplest or cheapest, but I think it looks good and is very strong. I started by mounting 8" Yak Attack Geartrac on each of the side handles. After some trial and error in the location, I found the needed to be far to the rear of the handles, so the cross bar I was to add didn't hit the seat. I used 1-1/2" 80/20 brand aluminum extrusions for my cross bar and mount. 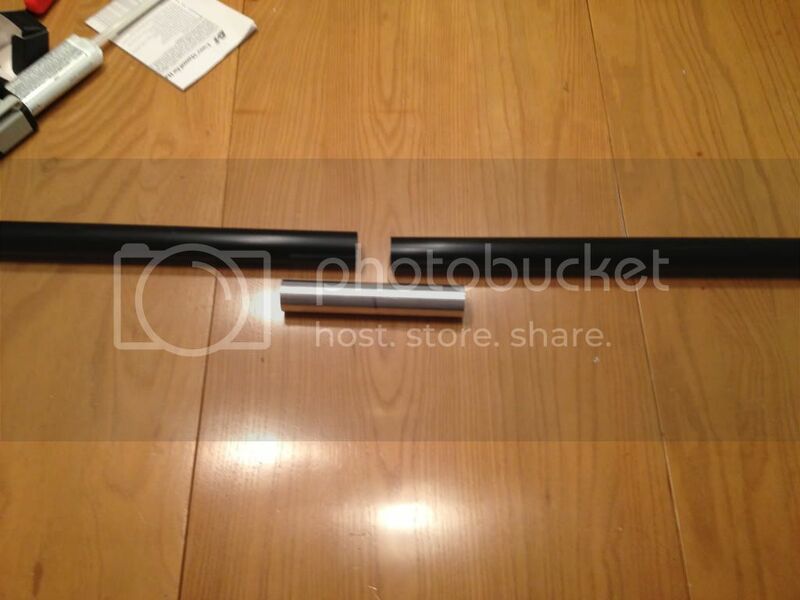 I ordered a 48" piece from McMaster Car, then cut a 6" piece off of it to use as the doubler to mount the motor on. I also got a 3" wide x 1/4" piece of aluminum to put on the face of the doubled up extrusions for the motors camp screws to tighten against. After I get a chance to set the height in the water, I may shorten the shaft ad possibly remove the head and make up a control box within easy reach from the seat. cool mod! love thems 8020s! did you take it out on water yet? do you feel it is much more stable? btw, what is the diameter of the sidekicker tubes? Haven't had the chance to get out yet. Hopefully this coming weekend. Tubes measure 1.165 OD x 1.070 ID, using calipers. Got a chance to try ut the Sidekicks and Trolling Motor today. Both worked really well. I was on a very flat inland lake, but very happy with both. The Sidekicks made a huge difference, I was able to lean and reach over the side without feeling like I was on the edge of going over. The trolling motor worked well. It took a bit of getting use to the motor thrust on the left side. Boat turns pretty hard to the right upon startup. Once moving its not bad. Turning the motor slightly toward the boat makes a big difference. ........."The Sidekicker kit is NOT designed for the width of the PA."
The cover doesn't fit, the Sidekick doesn't fit, the Evolve doesn't have a rear mount etc. Yep, all it would take is to make the center tube 36" long instead of 24" long. The other modification that they would most likely need to make is to adjust the bends on the outer tubes a bit. As they are now, with my weight in the boat the floats are in the water when on the lowest setting. With a lighter person, they may be just barely touching the water. My guess is that they don't make a PA specific set of Sidekicks because of the innate stability of the PA to begin with. Thus the number of people who would opt to buy a set of Sidekicks for the PA isn't likely to be sufficient to overcome the cost of designing and producing a set of Sidekicks just for the PA, even if it only took a wider center bar section. Hobie's in business to make money. I'm sure somebody there has run the numbers and if a PA specific set of sidekicks would be a money maker, they'd be offering them. Really Tom ............ it's the Fat old guys like me that have the disposable income that and the PA is not stable enough for me to stand safely without pontoons. There are alot of people that would pay for the stuff. As the guy said ...... it would only take a rod to be put in place and that could be sold as an add on. Guess the numbers don't work out for the covers or the Mirage drive and probably some other stuff. They make the stuff for the other products and the PA is an after thought. I bought the Scotty outriggers and I like them but they make the Plastic flex which I don't like. It needs a cross member to relieve the stress so it doesn't flex. I'm now making my own. Sure they would make stuff for ALL of their products. If the PA was an afterthought, it wouldn't be in production. You say "a lot of people" would buy a PA specific Sidekick set, but can you put a number on just how many people that would be? I wouldn't think so. In fact I doubt you can put a number on the total number of PA's sold to date. But Hobie can, and they also have a pretty good idea of the percentage of Sidekick sales to model sales. I recently sold a propulsion system that I designed for the Pro Angler a couple years back. The buyer said that he intended to use it for another purpose as the number of possible sales through PA owners didn't justify marketing it in that version. What we think is a big number, often isn't to someone that has to justify a certain cost to produce the product. I'm sure Hobie has either already run the numbers and found them lacking, or perhaps found them to be favorable and are already working on the items suggested here to be released at a later date. I tend to agree with Tom's comments and am sorry you have such disappointment with Hobie and how they market the PA. I look at it in the vein that it's a "plastic" boat that is marketed to appeal to a broad audience. 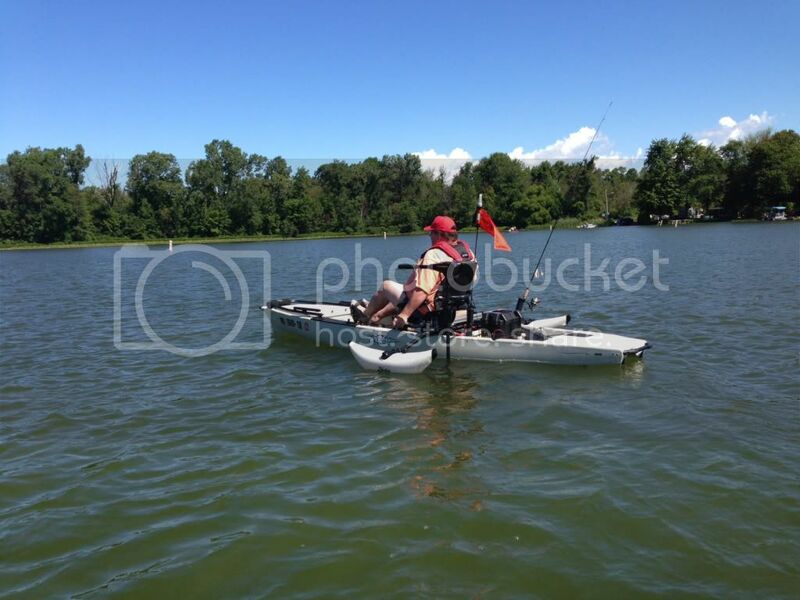 My personal feeling is that a lot of the Hobie accessories that aren't specifically made for the PA are made to adapt the traditional kayak models Hobie makes to be more suitable for fishing and stability like the PA. The PA to me comes across as a basic fishing platform that allows individuals to customize and tailor it to their needs. I'm sure Hobie looks at a lot of feedback from both their sponsored users, public events and especially this forum. I have seen a Hobie presence in this forum on an almost daily basis and I know they read what's said. I have to commend Marty on his ingenuity in adapting those accessories to work for him. Yes it will tilt over easier if you are a plus sized person. But I don't think the 600 pound weight rating implies a stability against rollover. The CG is pretty high to start with as some folks realized when using the Vantage seat in the upper position and turning sharp at a fast speed. I do fish from mine standing up a lot and find the stability to be very adequate for me. Have a great evening. Tight lines! For the record, I would be interested in the pontoons. ......... "If the PA was an afterthought, it wouldn't be in production." Really Tom .......... ya want to twist what I said .......... Never was the PA in question ........ it's the accessories that are listed for the whole line and don't fit the PA ....... you know the Flag Ship of their line ....... the most expensive non sailing Yak of their fleet ........ it just frustrating when you buy something for your pride aand joy and realize it doesn't fit the product ............. Its a Rolls Royce and should be treated as such. The same Mirage Drive is used on a wide variety of different boats. Thus making it more economical to produce and far more likely to sell in large numbers, as it has done. You keep saying that there is a market for all these various add-ons for the Pro Anger but still haven't given any numbers as to just how many would actually buy them (I wouldn't be interested in any of the items you mention). Now Hobie would certainly have some idea of what that market really is and yet they don't offer these things (yet anyway). Do you suppose they are just adverse to making money? Or could it be that they have some information that you don't? Hobie does a pretty darn good job of filling market needs, provided the sales are there to justify it. How do they work. I will soon be getting a PA 14 and taking it into the ocean. If these will cause me not to flip and lose half my gear I might have to do the same.